Dragon has already launched 1/35 scale kits of the famous and formidable Tiger I tank with molded-on Zimmerit, and these were welcomed with open arms by modelers since it saved hours of labor and offered an instant solution to the problem of accurately portraying this unique German anti-magnetic paste. Dragon has added a spectacular new kit to this big cat’s Zimmerit family, a Tiger I Mid-Production. Most obvious is the stunning new box top art lavishly produced by Mr. Ohnishi, a famous military illustrator from Japan. The full coating of Zimmerit on the hull and turret is reproduced to an extremely high quality in terms of the pattern and scale effect. To ease assembly, the tank includes convenient DS tracks as well. This is truly a masterpiece that blends computerized technology with the touch of a skilled sculptor. Dragon can confidently say it’s the highest-quality Tiger I available on the market. And with such a beautifully painted box top by Mr. Ohnishi, a famous military illustrator in Japan, this is a must-have for Tiger connoisseurs! Dragon has offered kits of the Ausf.D before, but this latest model is a brand new item that utilizes completely new toolings. Indeed, the only reused components on this 1/35 scale plastic kit are the on-vehicle tools, and the DS tracks that have been used on Dragon’s previous Panzer IVs. 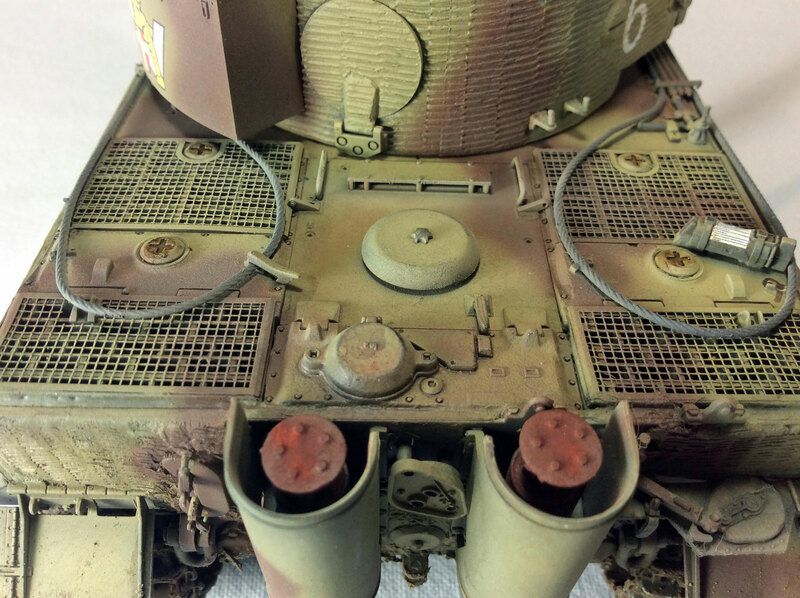 This completely refurbished tank thus gives modelers a Panzer IV D built to the very highest Smart Kit levels. Furthermore, the highly experienced design team has sought to minimize the number of parts wherever possible so that model-makers are spared the ardor of repetitive assembly. It goes without saying that they’ve done so without sacrificing any detail either. This kit fits together with ease, and it now offers even more assembly pleasure thanks to the clever engineering. Indeed, the early-war Panzer IV D has been given a new lease of life! This newest Grille kit comes with a generous selection of photo-etched parts to complement the high-quality plastic components. As a special addition to celebrate this release, Dragon is including a complementary figure set of self-propelled artillery crewmen to populate the vehicle. This fine new 1/35 scale kit, which sees the Grille available once again, will have fans chirping happily like crickets! Dragon is proud to offer a new 1/72 scale kit of just such a StuG.III Ausf.F. It features completely new parts (except the lower hull), including the upper hull, fighting compartment superstructure, engine deck, sprocket/idler wheels and others. Moreover, for modeling convenience, the new road wheels and track run are made as one piece. With Dragon having already issued a StuG.III Ausf.G kit in this scale, it’s now time for the preceding mark to receive the same high-quality treatment within the company’s 1/72 set of armored vehicles. Dragon has previously issued a 1/35 scale kit of his Tiger I tank, as well as an associated figure set of his crew. Now Dragon has turned its attention to the early part of Wittmann’s career, where he cut his teeth commanding a StuG.III Ausf.A during Operation Barbarossa on the Eastern Front in 1941. At that time he fought with the elite LAH Division. Dragon has previously introduced high-quality kits of the StuG.III Ausf.C/D and the Ausf.E, so this kit of the Ausf.A is a welcome addition to the infantry support/tank destroyer family. Not only does it allow modelers to build a stunning Ausf.A, but it permits Michael Wittmann’s own vehicle from 1941 to be accurately depicted. This kit is superbly detailed, featuring a brand new upper hull and superstructure roof. There are also two new storage boxes on the rear. To top it all off, the kit will contain appropriate Cartograf decals depicting Wittmann’s vehicle. The newest kit portrays such a flammpanzerwagen with a welded hull and there is an impressive level of detail visible in the open-topped fighting compartment, including the projectors, spray tubes and fuel tanks. Indeed, two sets of projectors are offered (with or without covers) to ensure modelers can display the kit precisely as they wish. Two flame operator figures and a driver figure are included, and the former even come with alternate heads wearing field caps or flame proof hoods. This 1/35 scale kit is scorching hot in every imaginable way, so it makes a great addition to Dragon’s upgraded Sd.Kfz.251 family! It is far more than the sum of its components that were previously available from Dragon – an Sd.Kfz.250 halftrack and an 8cm mortar – for it has a many great brand new parts. The one-piece upper hull (from the hood to the rear plate) is completely new, for example, in order to replicate the correct shape and details of this mortar variant. The vehicle interior has received a makeover too, including new mortar base, ammo boxes, seats, engine and full interiors to match the mortar version. There is ample ammunition storage as well. This is a new halftrack variant from Dragon, and it does look different from others that have gone before. For modelers seeking extra firepower and impact, this Sd.Kfz.250/7 is the ideal choice. Dragon has expanded its formidable Sd.Kfz.250 family with a 1/35 scale kit of this Sd.Kfz.250/4 Truppenluftschutzpanzerwagen mit Zwilling MG34. While this halftrack variant never saw battle, it was field-tested, offering modelers ample scope if they elect to put it into a suitable diorama. The Zwillingssockel 36 is newly tooled with highly detailed plastic injection and photo-etched parts. Just like the original dual-MG mount, it can also traverse 360º. The front armored shield is also newly tooled. To create this Sd.Kfz.250/4 variant, the fighting compartment interior has been appropriately rearranged. As part of Dragon’s facelift Sd.Kfz.250 series, it has an updated upper hull and Magic Tracks. This halftrack type has not appeared as a plastic kit before, so it offers modelers something different. Enemy aircraft beware with this new 1/35 scale kit! WW2 Barwell Island Bunkers - Funny Drone Footage!!! Unique Chance For You!! M4 Sherman Medium Tanks, For Sale!